Cal Day is on Saturday, April 21! Check back often as we update information about where the Arts District will be located at the Cal Day Marketplace! Download the Arts + Design Access App and Claim Free tickets to Experiences! Students! Claim FREE tickets to arts and design experiences, performances, events, exhibits and more on Campus and in the bay area! 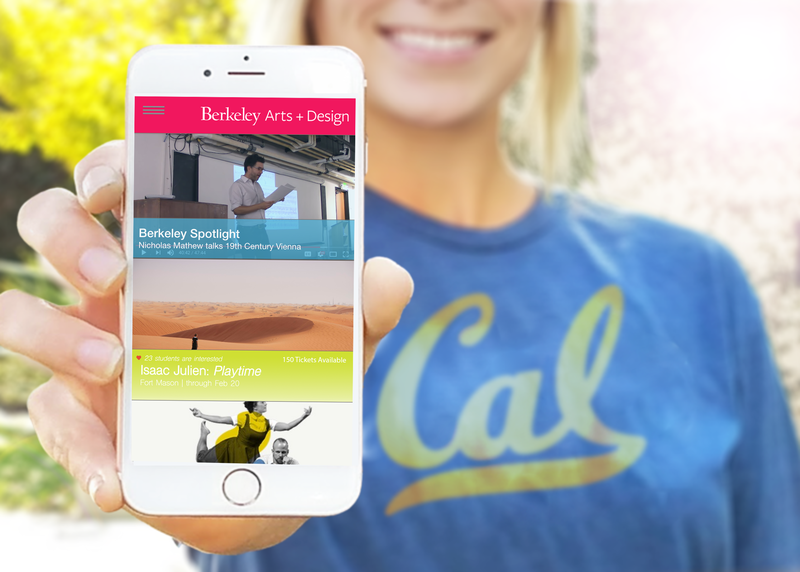 UC Berkeley students can “claim” dozens of free offers to attend arts and design related experiences by using the new campus arts access app. With new opportunities added weekly, you can tap into your creative interests, or develop new ones, at UC Berkeley! Download the app today to claim tickets for exhibitions, performances, and events, like the Bay Area Book Festival, YBCA, The Crucible, OMCA, Magic Theater, and more! Plus, explore free perks that UC Berkeley students already enjoy, like free admission to BAMPFA, UC Botanical Gardens, Magnes Collection of Jewish Art and Life, and the Hearst Museum of Anthropology! Unlock Your Creative Calendar Today and Claim Tickets! Visit Arts + Design Programs at Cal Day and Win Prizes! Follow the roadmap below to learn more about UC Berkeley’s creative campus and earn Berkeley Arts + Design gear and prizes while you do! Pick up a Berkeley Arts + Design Cal Day flyer at any of the informations booths on campus or at any of the booths listed below in the arts district, located in the Cal Day marketplace! Two steps to claiming your prize! 3. Search and claim free offers for tickets to events, performances, exhibitions and more! 2) Visit any 4 of the following booths at Cal Day to learn more, collect a stamp on your Berkeley Arts + Design Cal Day card. *Bring your card to the Berkeley Arts + Design tent at the end of the Cal Day arts district and claim your prize! Take a tour of the Creative Campus! Download a map of the Arts + Design campus here and follow this guide! And, watch this fun reel of our snapchat takeover where we tour the campus in the visual arts, performing arts, literature, film/media, and design. Visit the Cal Day 2018 website for details.